So, today I downloaded a very smart looking little gif file that displays on my screen and helps me to fine-tune my focus on each of my lenses, on each camera! So, given I have 4 lenses and two working cameras that’ll be eight micro-adjustments then? Yep, you have it. The cameras are clever in that they always remember what adjustment you made for each lens. However, adjusting them is quite a complicated business. After a few hours of really tight fine tuning, a bit of trial and error and tweaking, I find that all my lenses were pretty much spot on in the first place! Grrr…..or, as I am now contemplating, have I done the adjustments wrong? I changed my Sigma 85mm by -7 on the 7D, that was by far the biggest adjustment made. Gonna re-check it though cos if its a smidge out, it will show up as soft at its widest aperture of f1.4…. Its a fun and exciting life ya know. Oh well, the Jessie J gig confirmed with some details, so off we go tomorrow afternoon, with some info not really nailed down so it might be a real anti-climax as the ‘heavies’ deny us access, or only to the sound check, or only one ticket etc etc!! Hey, just got word that I will be taking photo’s of Jessie J and her guitarist at the O2 in Bristol on Friday!! 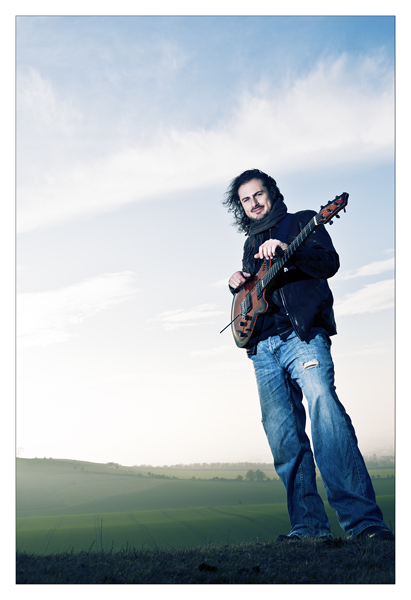 Woop woop – I feel a new Godin ad coming on…… This project is cool!! 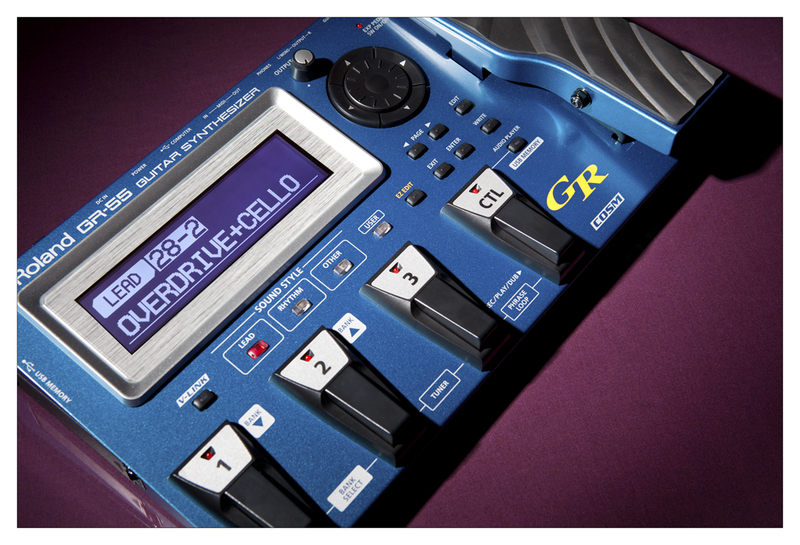 To complete a hat-trick of musical promo shoots I was also asked to shoot the new Roland GR-55 guitar synth. This synth is in a different class (for those that know about it) and as a product shot, looks like the dogs. I haven’t included the actual image they are going to use for promo purposes (as that would not be the done thing as it isn’t published yet!) but you get the idea of the synth with this one. Shooting these things is always fraught with difficulty due to shiny surfaces and light reflection. What you hope will be a fairly straightforward job can in fact take hours as the perfectionist in you comes through and you can be seen gently nudging lighting rigs just to get the right bounce etc! It is all great fun but can be hugely time consuming…. My aim in this was to try to replicate a kinda ‘live’ feel given the one ‘spotlight’ and the rich back colour. 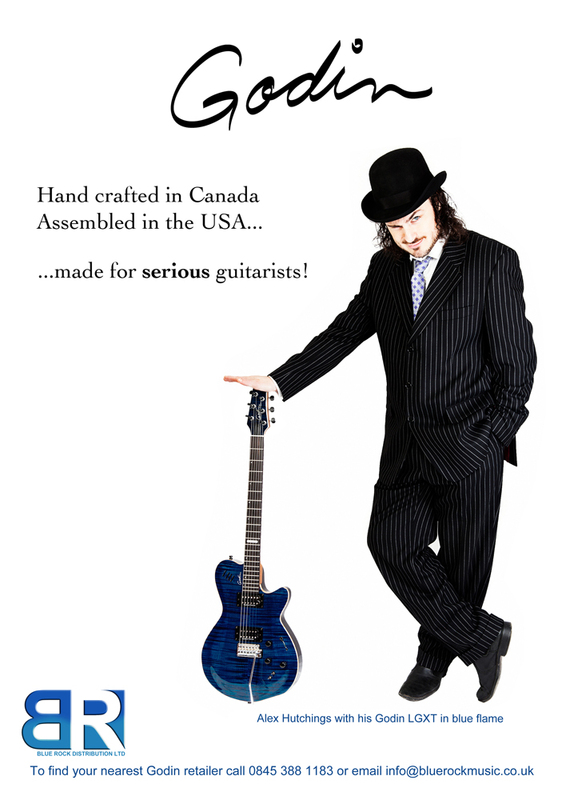 These images were also taken for the Godin Ad campaign and feature an amazing guitarist, Alex Hutchings. The idea was to shoot several different styles to Alex that challenged both him and the brand. You will see from the site link that we did both studio and location shots – but the main advert was an attempt at a Charlie Chaplinesque theme with a Godin as a ‘cane’ instead of the real thing. Alex was brill and really played the part well. The outdoor shots were taken up at Cherhill White Horse in Wiltshire. It is a helluva climb but we made it up there at sunset in deep Winter to grab the shots of Al looking rather too cool for his own good!! For the techies amongst you, we only lit him with the sun and a bare flash mounted off camera. We were deliberately trying to get some harsher shadows and contrast between the amazing landscape and Alex himself. Here is the first of hopefully many images that will appear on these pages. 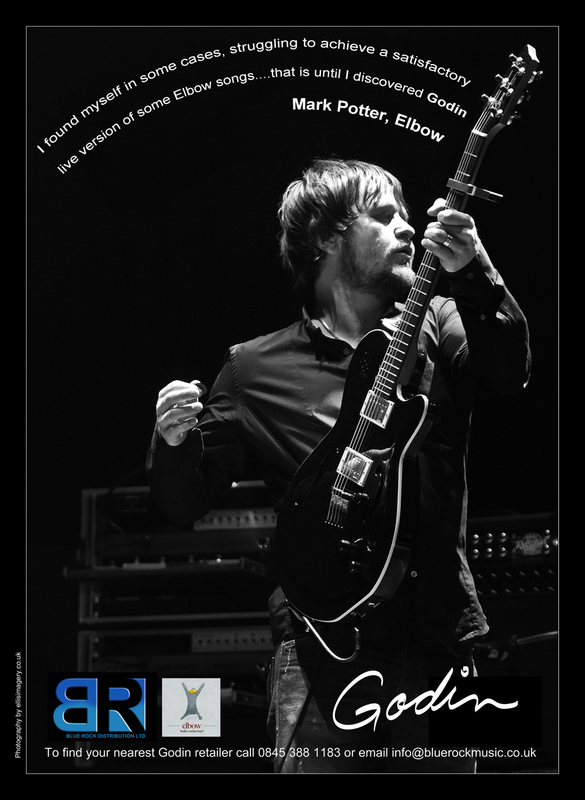 This is the advert we have designed for the Godin Guitar shoot with Elbow guitarist, Mark Potter. A nicer and more down to earth chap I couldn’t wish to meet. Look out for this in all good guitar mags in the coming months. The image used was shot during a sound check the band did at Birmingham NIA last Tues 22nd March 2011. A couple of edits needed but we think its looking good! Well, here we go. I shall embark on a new world of updating this blog as often as possible and posting interesting and exciting things happening in our photography business! Keep checking back for witticisms and photo’s that will blow your socks off! !